I've talked about my mom repeating dishes very often. This is one dessert that my mom replenishes after each batch was gone! It's scary! My mom made this almost every weekend when I was young, about 9-11. Either she would set it in huge bowls and cut into wedges or she'ld set them in tart tins. And she loves it being separated while I prefer it being homogenous. My mom has a sweeth tooth but her sugar level is perfectly ok, even until now. Let's talk about her adding in sugar to her 3in1 coffee. I am nowhere near her standard. Maybe it's because of the way she grew up, she eats rice porridge with sugar and douse her rice with kopi-O like soup. 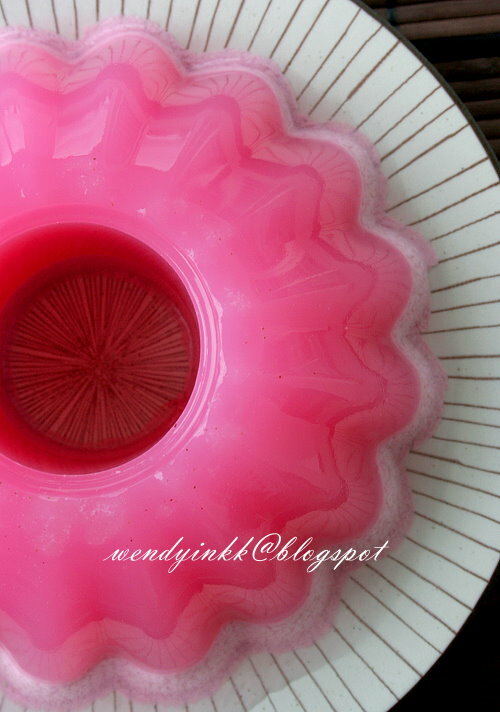 When I decided to throw an old fashioned party for my hubby (Nov 2011), I decided to make an old fashioned jelly too, that is pink in colour, haha. I do remember in the olden times, most jellies are pink and flavoured with pandan. 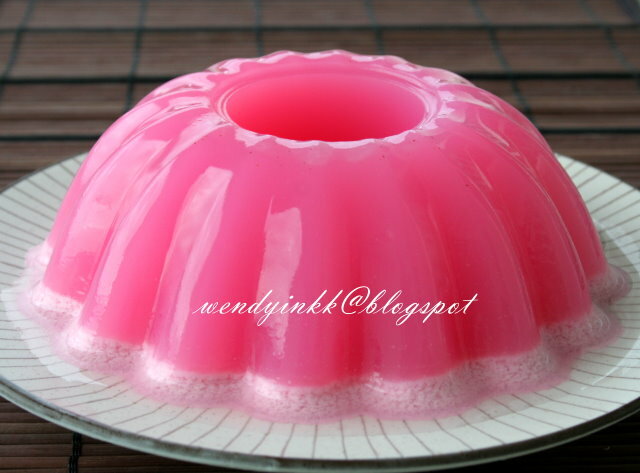 Even until today, my hubby likes pink pandan infused agar-agar. 1. Bring 750ml water and pandan knot to a boil. Lower to a simmer for 5 minutes or until you can smell the pandan. 2. Add in sugar, adjust the taste to your preference, making it slightly oversweetened. 3. Mix agar powder with 125ml water. Stir and pour into the boiling syrup. Bring it back to a boil, turn heat to medium low. 4. Add in food colouring and then pour in the coconut milk, don't stir it and let it come back to a full boil. Turn off the heat. Remove the pandan knot. 5. Wet some jelly moulds and shake off excess water. Pour the agar agar into the moistened moulds. 6. Let it cool down and solidify. Best served chilled. My dad also add sugar to his 3 in 1 coffee. Scary. The older folks love sweet things! I am different, my parents always nag i put too much sugar in my drinks but over the years ive learnt to go without it because stuff like milo somehow are rather sweet by itself dy, and we're not even talking about 3 in 1. Frankly, malaysians consumption of sugar is rather scary. Sigh! This is so nostalgic. Mum's cooking was so-so and when we gave the rare praise for certain dishes, she would repeat until we were so scared of it. Like your mum, she had a sweet tooth and drank only tea with sugar, never plain water. Never had a single day of blood sugar issue. 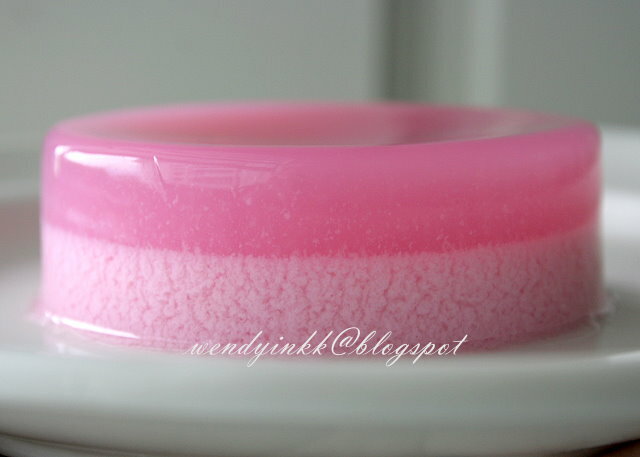 Pretty in pink jelly. Perfect with the warmer months and BBQs coming up over here. Thanks Wendy. U make me wanna make agar agar at this hour! Regretted for reading your blog at this hour. Darn!!! I recently came across your blog and have been reading along.Nice blog you have here! !This post made me nostalgic, brought back lots of found memories .......ohhhhh Mennnnnn....I have to have this now!!!!!!!!! This is simply beautiful! I love this old fashion Jelly! It's a symbol as well. Made from the heart. agar agar powder means those from the packet like the flying swallow brand is it or is it those strips? Powder is not strips. Serbuk agar agar. Usually found with Mermaid brand or Star brand. Don't use Nona. 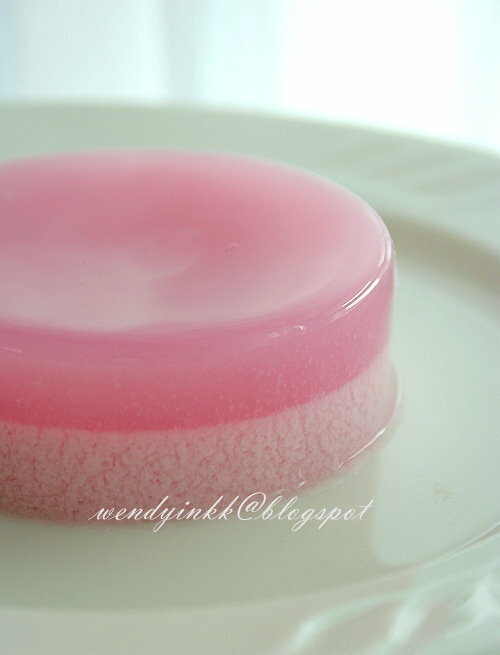 i've tried to cook this jelly today but it didn't separate into 2 layers. Did you stir it immediately after putting coconut milk? Why is my coconut layer is so thin? Did you buy your coconut milk or did you press it out with water? How do you get two layers? Did you do one with coconut milk and one without? Do step 4 like how I wrote it.